On Sale Now! Free Shipping Included! Save 9% on the 56’ Ninjaline Intro Kit by Slackers at Online Casino Artist. MPN: SLA.817. Hurry! Limited time offer. Offer valid only while supplies last. Train like a Ninja with the patented EXCLUSIVE Slackers NinjalineTM 56′ Intro Kit (50' line and 6' ratchet strap), with seven hanging obstacles. 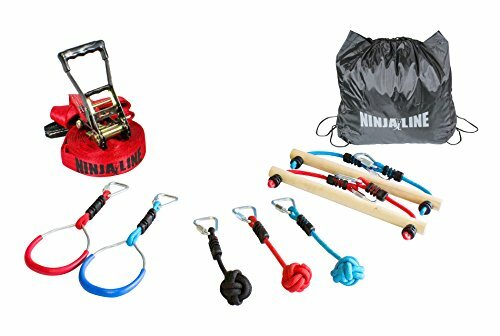 Ninja Training kit with 7 obstacles: 3-pc 10" x2.5" rope knots, 2-pc 16" monkey bar holds w/triangle safety carabiners, 2 gymnastics rings with textured finish. Kit Includes carrying bag. Hang 50' solid line with 2" Slackline webbing between 2 posts or healthy trees. The 50 foot line comes with 18 pockets allowing for even more course customization as you spread obstacles out or add additional more difficult items! Simple set up and take down means you can take your ninja training with you anywhere!